The Akva Solar tank is designed for use with heating systems that incorporate solar thermal heating. The Akvair Solar accumulator tanks all have a solar coil installed at the bottom of the tank. For domestic hot water there are 2 coils installed, one at the bottom of the tank, one at the top. The water in the bottom of an accumulator tank should be much cooler than the water at the top (a sign of good stratification). The cold mains water supply is run through the first coil at the bottom of the tank - which raises the water to this lower temperature, typically 30-40 degrees. The water then goes to the top coil where it is brought up to temperature. Because it was preheated in the bottom coil less heat is taken from the very hot water at the top of the tank which helps to maintain that nice hot water at the top = good stratification. Each Akvair Solar accumulator tank comes with a solar baffle. The solar baffle is essentially a round plate of metal about half way up the tank which splits the tank into two compartments, a top and a bottom. In the middle of the round plate there is a round 150mm hole. When the solar coil is heating the bottom of the tank it is liable to create water currents in the tank. This could potentially mix the cooler water at the bottom of the tank with the hot water at the top resulting in a mixed (badly stratified) tank of warm water. The baffle stops the water at the bottom of the tank from mixing with the hot water at the top, but at the same time still allows water up into the top of the tank as and when needed. Like the AkvaStandard thermal stores the Akvair Solar tanks have tappings which allow you to link in a heat source (like a boiler stove) to the tank, 2 tappings for electrical immersion elements (for backup heating), a place to attach a thermostat, and a tapping on top for the pressure relief / air bleed. The Akvaterm Akair Solar thermal store is rated at 3 bar which means you can install it on vented or pressurised systems. Our heating engineer can assist you with determining which size of accumulator tank is right for you and can help you to plan a renewable heating system which really works. Generally a high output boiler stove will require a larger volume of water than that needed for the solar thermal. So the size of the Akvair Solar accumulator tank is usually determined by the size of the boiler stove - as long as the boiler stove is intended to heat the whole tank in the winter, not just contribute in a smaller way to heating the tank. An upgrade from the Solar tank is the Solar Plus. The Solar Plus tank means that you can effectively provide domestic hot water from a large accumulator tank. The Solar Plus has an extra solar coil at the top of the tank. 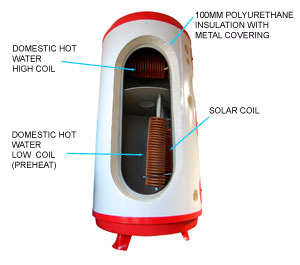 The hot water from the solar panels is directed first to the bottom coil until the temperature has gone over 53ºC at which point it starts to be routed to the top coil. By directing the warm (but not hot) solar hot water to the bottom of the tank this heat is captured and, if the top of the tank is not above that temperature already, then this heat will then also spread to the top of the tank through the solar baffle. Once the solar hot water starts to shift over to the top solar coil the top of the tank will heat up very fast giving a very fast response time, which is especially important with larger accumulator tanks. The solar hot water is still going through the bottom coil which will pass any remaining heat into the bottom of the tank. This means that more total energy is recovered from the solar panels than would otherwise be the case, plus the tank reacts faster than a single coil version so you have usuable domestic hot water in less time. The Solar Plus comes with an Oras valve as standard which cleverly makes use of both hot water coils. Our Solar tanks also come with this valve as standard as we think it makes great sense. You will find details for the Akvair solar tanks below. The DHW (Domestic Hot Water) coil is 9.4m long and made of 22mm finned copper tube, the solar coil is 12.2m long and made of 18mm finned copper tube. We have a range of immersion elements in stock. Of note are the 1kW, 2kW and the combined 1kW and 3kW immersions. These are ideal for use with PV systems because the Feed In Tariff assumes that you consume 50% which in actual fact you usually do not. So you may have either an intelligent controller which diverts 50% of the electricity produced, storing it as hot water in the thermal store, or a more simple setup using a timer to achieve the same end. For a 4kW system the 1kW and the combined 1kW and 3kW immersions are most suitable. This product currently has no testimonials.